It’s hard to find completely unique puzzle games these days, what with more games copying other popular ones. So when I came about Freeze! I was truly in awe. The black and white graphics go against almost all gaming conventions, for starters. If you’re looking for cute, cuddly characters in a colorful candy-land world, forget this game. But — if you’re looking for the exact opposite, then this one is definitely worth checking out. Freeze! is primarily a puzzle game — its objective is to help the hero reach a certain portal while avoiding pointy objects on its path. It may sound simple enough, but with this game, things are easier said than done. 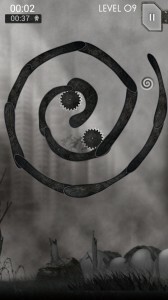 The game’s character, which basically looks like an eyeball that rolls around the path, is stuck inside a framed maze. 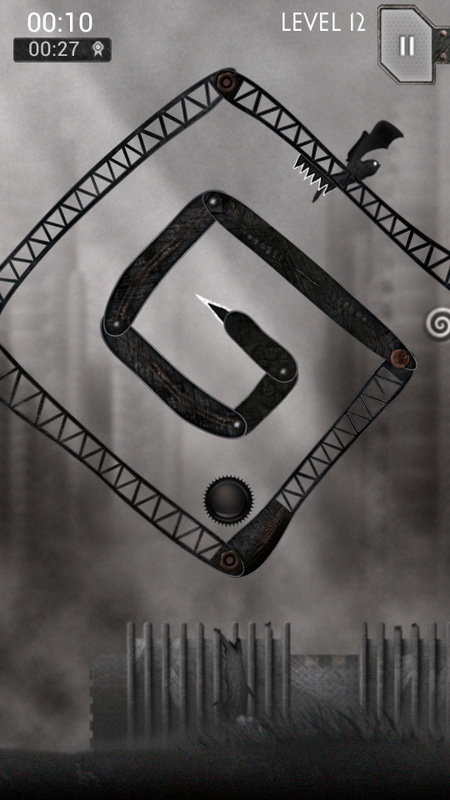 You, as the player, must maneuver this frame whichever way you like (it rotates 360 degrees) and keep the hero rolling towards a little portal on the end of the maze. The path is not always smooth and death-free. 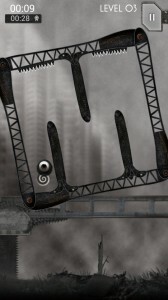 Ragged edges, revolving axes and other perilous objects are flung right in the hero’s way, and it’s mostly where the game’s challenge comes from. Maneuvering and having physics-based common sense is required, but doing this while avoiding pointy things doubles the difficulty. To help with game play, a freeze button is provided for some levels — not all. This freezes the hero in place while you can rotate the frame to manipulate where he rolls or falls into place — ideally a safe one. To release the hero, you can press the freeze button again. Note that there’s only a limited number of times you can freeze your hero, and this number is indicated right beside the bigger freeze button. Once your freeze limit is up, then your hero can no longer float in mid-air to avoid a deathly collision. During the game, a timer is shown on the top left corner of the screen. This may add a bit of pressure, but it doesn’t impact anything else in the game aside from beating your own record. 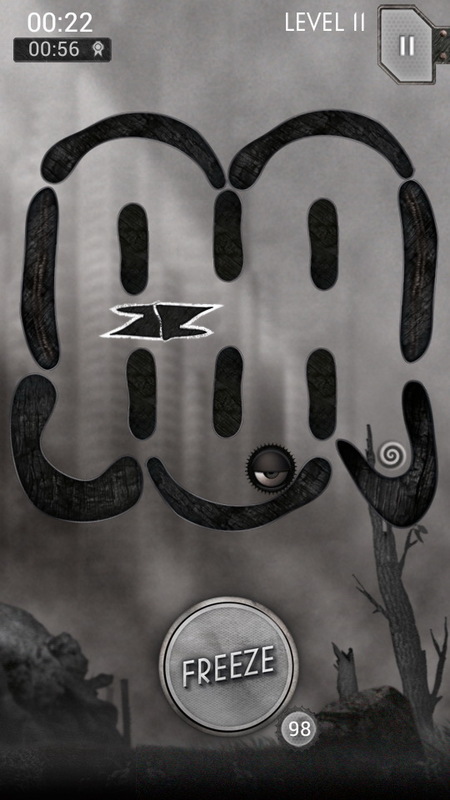 The game itself doesn’t have a time limit, and the timer is not a count down, but a way to measure the shortest time it took you to complete a level. 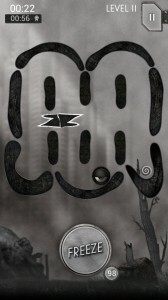 This is labeled as your Personal Best, which is shown at the end of each level. 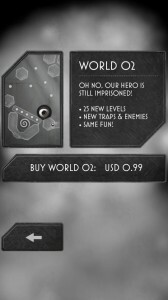 If you find yourself stuck in a level, a pop up offers for you to go to the game’s website, frozengun.com, to learn tips and tricks for each level. Here you’ll find YouTube videos of how to get past difficult stages. Although the videos can be helpful, it’s frustrating if you see that it can be done, but somehow you’re not able to do it. 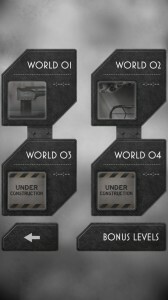 The game has four worlds, with around thirty levels for each. You are required to successfully finish all levels of a world before proceeding to the next one. Skipping this step involves a $0.99 in-app purchase. Although Freeze! has a minimalist look, it doesn’t mean that it’s not visually interesting. After a few minutes of playing, I began to notice how eerie the environment is inside the game. Background animations add to the game’s dark, weird world. Again, this may not appeal to everyone, and this game seems to suit certain types of players, ones that like to see something different and artistic. Visually, Freeze! 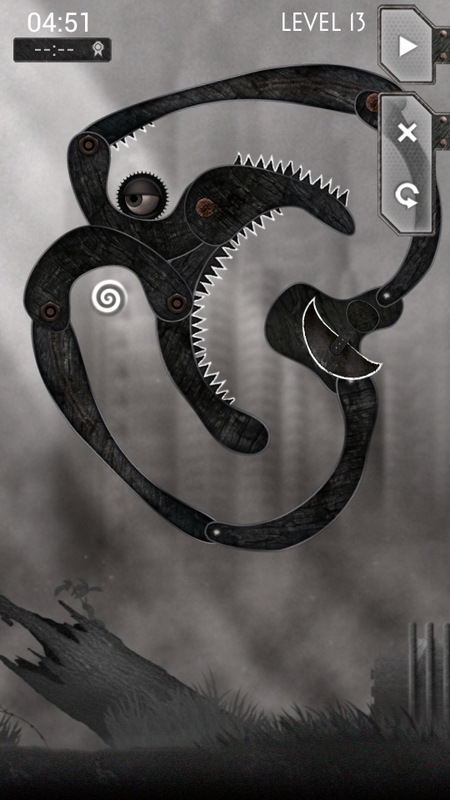 is a break from all similar-looking puzzle games out there. It may not be appealing to most players, but what it lacks in appeal, it more than makes up for in originality and clever game play. 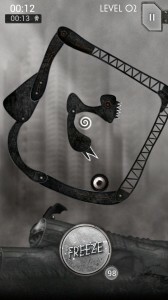 Due to its difficulty at some levels, this game is more suited to those who have both time and patience (and determination) to go through each level. 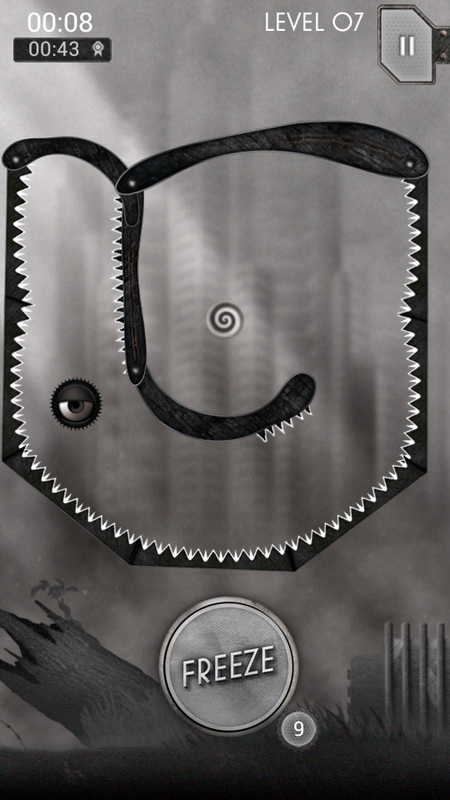 As the game restarts automatically after a failed level, it may get tiresome at some point and you simply have to put it down. However, the feeling of pride when actually getting past a seemingly impossible feat is worth all the replay. Even with its difficulty, it doesn’t change the fact that Freeze! is one of a kind. It’s a whole new gaming experience, and that might be a good thing for some people.